Recent research by nationwide audio description charity Vocaleyes, reported in The Stage, found that fewer than half of theatres programme for blind and partially sighted audiences. This is a shockingly low figure – just 10,500 people during three years attended the theatre out of a possible two million in the UK who have some sort of sight loss. But you can’t build an audience from those two million people without putting something on stage that they will be able to access and, equally importantly, enjoy. There are two jobs to be done here. First, we must grow the audience by communicating with those two million people better, and second we must be far more innovative in how we make audio description available. Audio description tends to mean popping an audio describer in the tech box every so often. This is not interesting or consistent enough to actually build a regular audience for audio-described theatre. At least, we need to ensure that the audio description voice and vocabulary is consistent with the show being described. Beyond that, there are many other more imaginative and engaging options: locating the audio description with a character on stage and not as a disembodied voice; integrating it into the design of the show from the beginning rather than being an add-on – these are just two examples. Why should a theatre invest in these options? What’s the point in continuing to offer and develop audio description when there isn’t an audience for it? To attract that audience, the offering needs to be regular enough to make an impact to people’s lives. An occasional, ad hoc approach is not good enough. Audiences will only build when theatres start consistently programming product that is of a high quality in a more broadly inclusive environment. This is quite apart the legal duty that theatres have to make ‘reasonable adjustment’ is anticipatory. Building audiences of blind and partially sighted people cannot be a discrete ‘project’. Disabled people don’t exist in silos: blind people are also wheelchair users, or from minority ethnic communities or gay; and blind and partially sighted people go to the theatre with their friends and families who also want a good experience. There are programming implications here, too, in terms of which stories theatres tell and how shows are cast. After all, why should I attend shows regularly, even if they are imaginatively audio-described, if I never hear my own stories being played out onstage? The theatre industry is noticing that there are many potential audiences we are not getting through our doors. If we are a society that believes in equality, we should be meeting all walks of life in our audiences. But to get them into our theatres, we need to offer something more than we are the moment. It’s time to get our act together. However, there are some green shoots. In May 2015, inspired by a previous co-production of The Threepenny Opera in 2014, my theatre – the New Wolsey Theatre in Ipswich – was successful in our application for £2.3 million from Arts Council England to create Ramps on the Moon. It is a consortium led by us with Birmingham Rep, West Yorkshire Playhouse, Nottingham Playhouse, Theatre Royal Stratford East, Sheffield Theatres and Graeae Theatre. Our mission has been to create and develop more opportunities for deaf and disabled actors, artists, participants, and audiences, to grow our workforces and make change happen in our mid-scale mainstream theatre sector. So what are we trying to change? By creating an integrated production once a year with seven partners across the UK, we want to create more provision for people that isn’t just on for one or two performances. The scheme is also helping the partner theatres to learn how to embed access for disabled audiences into their own working practices. Birmingham Repertory Theatre has created a version of Gogol’s The Government Inspector which is out touring the UK; we at the New Wolsey have just announced our tour of Tommy the Musical for spring 2017 based on the same values as every Ramps show including recruiting an integrated cast, and Graeae has been making its art across the UK and internationally for years. Each organisation will begin to build ways of working into its practise to ensure what they create is more accessible and inclusive, and start to work with deaf and disabled artists who bring a whole new level of creativity to the productions. The minute an organisation gets to grips with a new way of working, the easier it is to get excited by change. 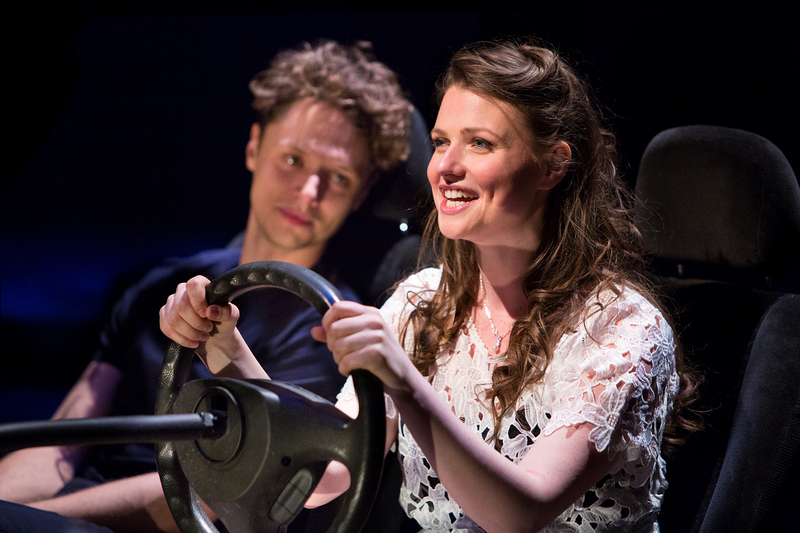 This is why we at the New Wolsey Theatre experimented with making our spring production of The Last Five Years completely audio-described throughout the run, rather than dedicating just one performance to host that accessible service live. We have members of staff, called ‘agents for change’, who are focused on precisely this kind of work. The agent focused on our artistic output is Jamie Beddard. On that production, he worked with the creative team during rehearsals to pre-record the cast delivering audio description. This meant we were able to provide a service that was available throughout the run – breaking down any restrictions on when a blind or partially sighted audience member could come to the show. Since employing our agents for change we are seeing a year-on-year increase in the number of users of our accessible performances and services. We had great feedback with our regular users who did not even realise that it wasn’t live as the quality and timing was so good. The freedom for them to come whenever they chose helped them plan to come with friends and family on dates that were suitable for all. The tour of The Government Inspector is halfway through its journey. Throughout the tour, audiences can use their own technology to engage with the audio description, which is delivered live by a performer on stage via the Sennheiser MobileConnect smartphone app. Audiences can download the app and use their own headphones to listen to the description as it happens. We asked our regular blind and partially sighted attenders to come in and experience the description on both of these shows and we’ll find out more about how the services are received as the audiences grow. But how do you know unless you try? Better to be able to come anytime you fancy than missing the one date a live description takes place. What we learned is that we will be able to provide this much more frequently. Current data might say there is little opportunity or users. We think that the way to get more of both is to bring access into the mainstream. We’ve been able to get an actor on stage to describe live as they perform through a headset, we fire cues off the desk that are pre-recorded. As touring productions are made, we think about how accessibility is incorporated into the shows early on in the process. The research by Vocaleyes into blind audiences, and the evaluation results that our consortium will present after The Government Inspector concludes its tour, will hopefully reveal there is an appetite for this kind of accessible work. But at the moment it’s too early to be able to see how far Ramps on the Moon has been able to change industry perspectives. However, we’re already seeing a wealth of positive comments from our post-show survey results – even noting second visits when a first visit would have been hesitant. Ramps on the Moon is a commitment made by the partners to instigate change and build on those audiences. We’re saying look at the fun you are missing out on by not being playful and testing new technologies that are out there. The data that Vocaleyes has provided is a catalyst for more conversation and development, and my god, those statistics need to change.